Tilda Bird Pond, Classics, and Shop News — Willow Cottage Quilt Co.
Tilda Bird Pond is soooooo close to arriving in the shop! What was supposed to be a June arrival, turned into a September arrival. While I know this is frustrating, there were some behind the scenes changes which halted all shipments to North America. We are back on track now, and I promise, this fabric is worth the wait! In fact, I hesitate to say this, but the delay was possibly a blessing in disguise. As many of you know, I badly broke my leg in the end of June. I was wheelchair and bed bound for the past few months, and was so worried how I would get the fabric prepared and shipped to you. Thankfully, I had friends and family step up and offer to help. I am much more mobile now, and while I am still not able to stand and cut fabric, my Mom is here to help! She is meticulous and will prepare the orders precisely, and I will be doing all the packaging, shipping, and anything I can do seated. We are counting down the days until its arrival so we can get started! If you have pre-ordered Bird Pond or Basics, the second payment listings are open now. You can find those here. The pre-orders sold out in a FLASH, and I have been trying very hard to get more fabric in. Unlike local fabric manufacturers, I am usually unable to order more fabric after my original orders, 8 months or so in advance of the release. I always think I've ordered far more than enough, but I definitely underestimated with this collection! As luck would have it, the warehouse told me yesterday that they found some extra so I have snapped it up! I don't know exactly how much more is coming, and for that reason I am unable to list it until it is here. However, if you see something on my website that says sold out, but you'd like to order, please email me via my website or reply to this newsletter, and I will put you on the waitlist for it. I won't be able to guarantee I'll have it until the fabric is here, pre-orders are prepared and I see what is left, but I will do my very best for you! 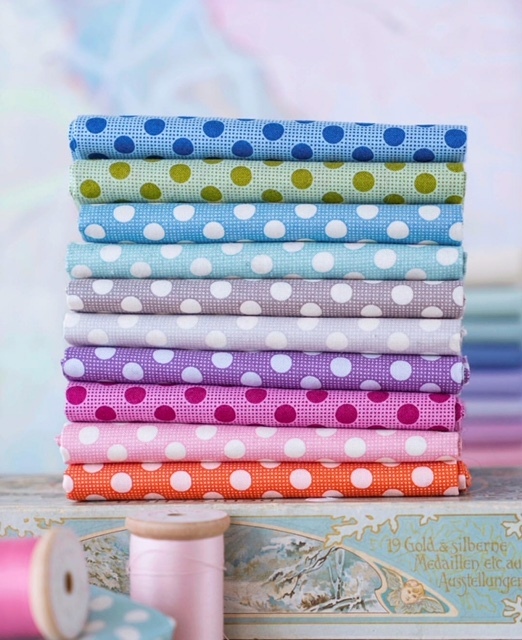 Of course, Tilda Basics solids and dots will be arriving too! As with Bird Pond, if you see anything you'd like that says sold out, I will likely have more once pre-orders are prepared. I'll be listing those ASAP but please email me if you'd like to be put on a waitlist for any particular prints/colors. "Tilda Classics is a new versatile collection based on three of the most popular Tilda fabrics throughout the years – Tiny Stripes, Stars and Dots, which have been slightly redesigned. We have also two new patterns to create a lovely soft, basic collection with a plethora of uses. 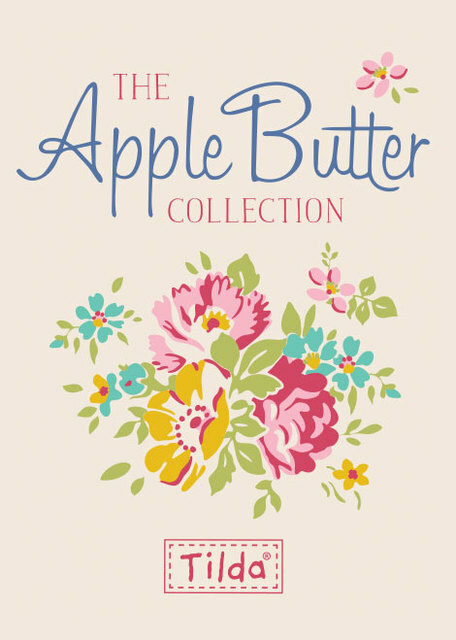 The patterns are hand drawn, which gives the collection a charming, homemade look, and come in three colorways. There has been a demand for this collection among customers making projects from older Tilda books. It will also provide a way to soften and create space between more colorful design fabrics. They are also a perfect alternative to solid colors. We have started implementing the basic collection in upcoming design collections and can’t understand how we managed without them before!" You can see all the prints and colors here, and they are open for order now, shipping in approximately 2 weeks. I also wanted to share my fall and winter plans with you, as this summer ended up being an unplanned, and unwanted break from my shop and the sewing room! Tilda is just.so.good! How does the Tilda designer, Tone Finnanger, comes up with completely different looks, but all in the signature Tilda style? She is one incredibly creative woman, whom I would absolutely love to meet one day! Thank you for taking the time to read my newsletter, and please do tag me on Instagram for any of your Tilda projects. My girlies are back in school, I can make it up the stairs to my sewing room, and I am ready to get creative and sew! Happy (almost) fall and happy sewing to you, my friends!